Still raining. The bus brings us to Shirakawa-Go, to ‘encounter a Japan that vanished long ago’, says their brochure. We trundle our luggage across the narrow footbridge over a raging creamy-caramel torrent in the teeming rain, into the World Heritage village of Ogimachi. On a plateau near the foot of sacred Mount Hakusan is an enclave of gassho-zukuri farmhouses, some of which are over 250 years old. We’re looking for Yokichi, the house where we’re staying tonight. The houses are made completely of wood, with steeply-pitched thatched roofs. A roof can be completely re-thatched in two days, by 200 local people. The shape of the pitch is said to emulate hands pressed together in prayer. Our hostess speaks no English and our Japanese is limited, shamefully, to about five phrases, but she makes us very welcome, and we go out again in borrowed umbrellas and gum-boots. The tour bus takes us miles, it seems, through tunnels and over bridges, and drops us just a few hundred feet above the plateau, so we can walk down the path into the village. 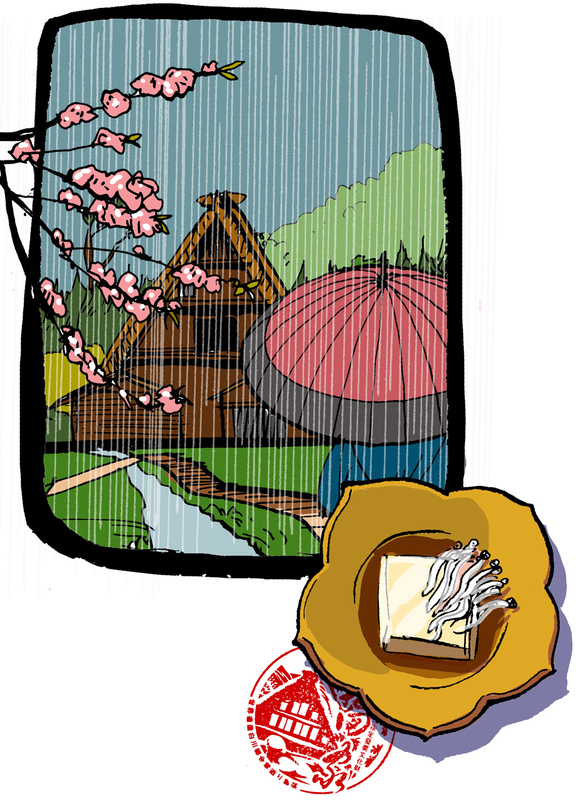 This is the Viewpoint, where umbrella’d tourists – all Japanese, no westerners – stand in a line, under the cherry-blossom, snapping away through the mist and rain. I’m standing, drawing the Toyama Family House, a museum now, its upper floors previously inhabited by silkworms. Its eaves are exquisitely knotted together with thick rope, hardened by smoke from the cooking fire. And the view of this house, with its gurgling stream running fast beside the wooden walkway, in the mist and rain, gives me a feeling that is almost, well, quietly transcendental. Yet another beautiful and refined meal: Salt-crusted trout, Hida beef steamed in leaves on individual stoves, soup with mushrooms, mountain vegetables, pickles, and an egg-custard with a shoal of tiny eel-like translucent fish, eyeing us rather pitifully.